Welcome to Your Undoctored Life: Start Here! Recipes, Meal Planning Tool, and much more! In this video series, I will summarize the Wild, Naked, Unwashed Program that is the backbone of the entire Undoctored lifestyle. It is crucial that you get this basic set of strategies down confidently, as it builds up health momentum over time and will be required should you, for instance, explore any of the supplemental Undoctored Protocols or Advanced Topics. The Wild, Naked, Unwashed Core Program establishes a solid foundation of health, functioning, and appearance. This video series only provides the how-to’s of the program but does not cover the scientific rationale. Refer to the Undoctored book for the full scientific explanation and rationale, including how and why the Wild, Naked, Unwashed program works so incredibly well. Also refer to other Undoctored Inner Circle resources, such as the discussion Forum and the Inner Circle Health Network collection of videos, to navigate any uncertainties and boost the chances that you enjoy a huge success. You will also find the Undoctored Recipes and Meal Plans resource useful along with the 42-Day Meal Plan Guide and Meal Planning Tool found there. This online tutorial is designed to work hand in hand with the Undoctored book and makes many references to it. the Inner Circle Program Reference is a companion tool that augments your ability to implement the Undoctored Program by providing references and links to additional resources within the Inner Circle website. 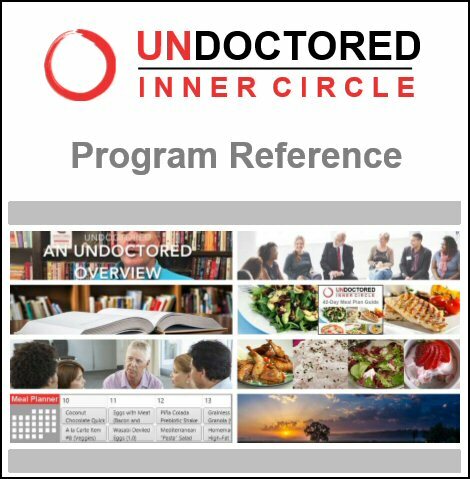 You can access the Program Reference by clicking the image at right or by clicking the "Member Extras" link on the Main Menu bar of any Inner Circle website page then clicking the "Inner Circle Program Reference" item on the dropdown menu. While there will be individual variation, the great majority of people experience a wide panel of dramatic health benefits, including reversal of inflammation, a change in facial and body appearance and reduction of body measurements, substantial weight loss, relief from many common health conditions, and, once the withdrawal/detoxification process is through, feeling better with more energy and optimism. Most people observe some changes even during the first 7-10 days, with greater changes over the next few weeks. Pre-program preparation Undoctored involves a dramatic shift in food choices. We choose real, single-ingredient foods whenever possible, while rejecting most processed foods, certainly those made with wheat/grains and sugars. We therefore begin by purging your kitchen of unhealthy foods made with grains—common grains such as wheat, corn, rye, barley, oats, rice, as well as less common grains such as amaranth, millet, sorghum, and triticale. We banish obvious grain-containing foods such as breads, rolls, and corn meal, as well as hidden sources. (A full listing of hidden grain sources can be found in the Undoctored book starting on page 346.) Then eliminate sugar-containing foods such as soft drinks, candies, desserts, etc. (Don’t worry: We will be recreating them using healthy ingredients.) Depending on your family situation, informing your family of your plans may be necessary. It will be necessary to restock your kitchen shelves with foods that fit into this lifestyle once you’ve purged the foods that previously impaired your health and weight control. This is also the time to obtain the correct nutritional supplements to meet your body’s intrinsic needs—they are not optional but are critical to your long-term success. We do not incorporate nutritional supplements to “supplement” your diet, but to address your body’s instrinsic needs that are not met by the habits of modern life. Leaving any single component out and your chances of long-term success will be impaired. Getting through the first 10 days of the Undoctored Wild, Naked, Unwashed program are the most difficult because about 50% of people will experience an unpleasant withdrawal/detoxification process from gliadin protein-derived opioid peptides. You may experience overwhelming fatigue, depression/sadness, nausea, and lightheadedness. While there is no way to not have withdrawal/detoxification, there are steps you can take to soften the blow that we will discuss. But getting through this process is crucial to start enjoying all the wonderful health and body changes that are possible. Because of the withdrawal process, we keep diet simple during these 10 days. We also introduce the important nutritional supplements, including a stepwise process of introducing the efforts to cultivate healthy bowel flora that are crucial for your long-term health. Once you are through the period of withdrawal and detoxification and starting to feel better, we expand the choices in meals and provide a more varied menu plan that is 100% grain-free, limited in carbohydrate exposure, and rich in nutrients. This is when many more complex health changes unfold, such as the reversal of inflammation and autoimmune conditions, consolidating the changes that began in the first 10 days. Many of the changes that began in the initial period with continue, often yielding unexpected and surprising changes in appearance, body measurements, and health conditions. The long-term future Many of the changes that began in the first 6 weeks continue: weight loss, reduction in visceral fat, reversal of inflammation and autoimmunity, improvements in bowel flora, etc. This is the time to explore Undoctored Protocols and Advanced Concepts, if desired, for even greater improvements in health unique to your personal situation or to enhance performance and appearance even further. and you're also likely to recognize issues that crop up over time, that you can address, if you understand what it is you're doing. So please treat these video series as something like a supplement to what is in the Undoctored book. But if you're interested in getting up and running quickly, this video series will get you there. But then, read the book, to understand why, to ensure your long-term success. We encapsulate this Wild-Naked-Unwashed program into six weeks, because that's about how long it take for many of the benefits to develop, such as adaptation to burning fat — that takes about 6 weeks, and that's why, for instance, I tell people not to exercise during these 6 weeks or so (certainly not the first 10 days, when you're going through the detoxification/withdrawal process we're going to discuss). Six weeks is the amount of time required to really start to develop some really magnificent, fabulous, changes in your health, the way you look and in your weight. Changes can start early, even the first week, but the biggest changes develop over the next several weeks after starting the program. Expect spectacular things to happen! Now What can you expect from this program? Expect spectacular things. Now there are impediments to your success, such as some prescription drugs, some over-the-counter drugs, health conditions like hypothyroidism. Those questions will need to be addressed if you find that you're not obtaining the kind of success that everyone else is enjoying. That's all discussed in the Undoctored book, the Undoctored Inner Circle videos, the discussion forum. Start the program. If you encounter hurdles, difficulties, failure, then start to ask why. It's not the program. There's something wrong with you, your health, that is — you take a drug, or you have a health condition that is obstructing your success, if you're following the program as described. But expect big things to happen. Expect weight loss, if you need to lose weight. A typical experience would be 15 to 18 pounds in these 6 weeks. It varies, of course. If you're a 297 pound sedentary truck driver, that experience will differ from a 23 year old pre-menopausal marathon-running female, right? So, there's going to be variations, but in general about that much weight loss. Inflammation recedes dramatically. Sometimes you can see it in the face, in the first 5-7 days. You can see a reduction in cheek width. You can see a reduction in the chin. You can see the around-the-eye puffiness reverse, and eyes get bigger. Skin texture changes. Redness will disappear. Joint pain can reverse. Common conditions like irritible bowel syndrome symptoms, like diarrhea, and acid reflux symptoms typically disappear in the first week. More complex conditions, like Type II diabetes and autoimmune diseases start to reverse in weeks for most people. Expect many very spectacular changes in health. You'll see a full listing of the conditions that you can expect to improve, or even fully reverse in the Undoctored book. This first video is an overview of this entire video series to cover the Wild-Naked-Unwashed program. We're going to start with the pre-program preparations, which are crucial in order to get started on the right foot with the diet, nutritional supplements. We'll go through all the things you should do, like purge your kitchen of unhealthy foods, and go shopping for the right ingredients and right supplements. We'll go over that in this broad overview of the program. We'll talk about the first ten days of your program, the period during which you may have a detoxification and withdrawal effect that can be quite unpleasant. Knowing how to navigate those 10 days, and blunt some of the unpleasant effects, while still carrying on your program, and succeeding, is going to be very important. We'll cover that, in detail. And then we'll go through the next, 32 remaining days, of the 6 week program, where a lot of these early changes, that start in the first 10 days, become consolidated — you get into the groove of the food, of the meal plans, of the nutritional supplements, and many of the initial changes really gain ground, and you have even more spectacular health improvements over those few weeks. And then finally, we'll close with some talk about some long-term efforts. You'll continue this basic program for the rest of your life, I hope, 30, 40, 50, maybe more years, but you can add some additional pieces, like some of the Undoctored Protocols. These are the protocols you can follow, simple protocols, and 2 or 3 or 4 additional strategies to the basic program, to address some conditions that do not fully respond to the basic program, such as conditions such as osteoporosis, osteopenia or calcium oxalate kidney stones, or small intestinal bacterial overgrowth. You can go further, with those with those conditions, than the basic program. Or maybe you want to explore some really interesting, exciting ways to improve your performance, looks, or the way you feel. Those are the more advanced concepts we cover, like how to add collagen to your lifestyle for better skin health and joint health. Or, how to use ketosis; either supplements that increase your ketone levels, or achieve physiological ketosis in your diet. So these are additional strategies you can follow for performance — not part of the basic program, but optional to follow long term. Put it all together, we want you to be well equipped to follow this program successfully and have a spectacular personal success.